Hello, Dear, Bloggites. Long time no review…LOL Today’s book review is on the first novel of a new author, The Dead Key by D. M. Pulley. As you all know, I am more forgiving of first time authors if for no other reason than I hope that once my novel is published, people will find that same forgiveness as they read my work. 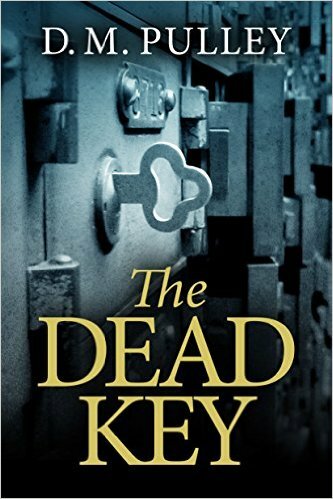 The Dead Key is a novel about a building engineer, Iris Latch (cute little play on words there with the last name, gave me a giggle), who is assigned the large task of mapping out a huge bank that was closed down in 1978. The bank sat vacant with no activity because it closed all of a sudden without any warning. As Iris wanders this bank she comes across a single key found in a desk drawer. Since the bank was closed all of a sudden, there were many personal items left by employees as if they just disappeared one day. Bored with her life and job, she decides to reach out to the lady whose name was on the desk that held the key. This inadvertent move finds Iris knee-deep in more questions than answers; and as she walks this bank, she decides to investigate further on what happened back in 1978 forcing the bank to close and lock its doors all in one day. As her amateur investigation starts turning up more questions than answers, Iris realizes she has opened up a can of worms that has many key players who have disappeared or died of questionable means. The basic plot of the book is very intriguing. I did enjoy the storyline, however, there were sections that dragged too much and broke the momentum of the book. This drag factor made it hard for me to truly get into the storyline and empathize with the characters in the book. The book itself received the Amazon Breakthrough Novel Award in 2014 and that is actually what made me pick this book to read. Amazon recommended it as a reading I might enjoy and I did enjoy it. Way to go Amazon! I do see a lot of potential in the author, D. M. Pulley and will continue to look for new novels by her to see how she matures and evolves as an author. I give The Dead Key by D. M. Pulley 2 out of 5 Bookmarks. The storyline is good but does drag in places. If you like to encourage and support new authors, I do recommend you read this one and keep an eye out for more books by D. M. Pulley.